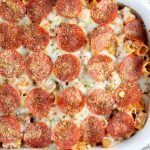 This Pepperoni Pizza Pasta Casserole is easy to make and has all the yummy flavors of pizza but in a casserole! Kids (and adults) will line up for this dish! 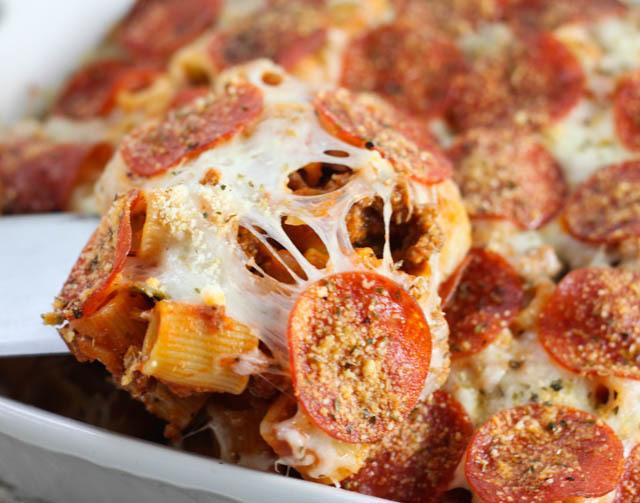 Pizza and pasta are two favorites around here so I knew this pizza pasta bake would be a hit! 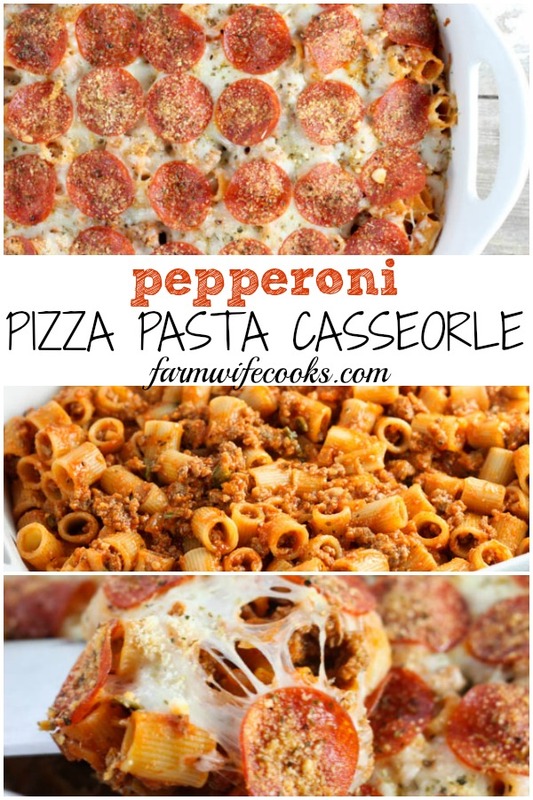 If you like this recipe you might also like these Pizza Burgers and this Deluxe Pizza Biscuit Bake. 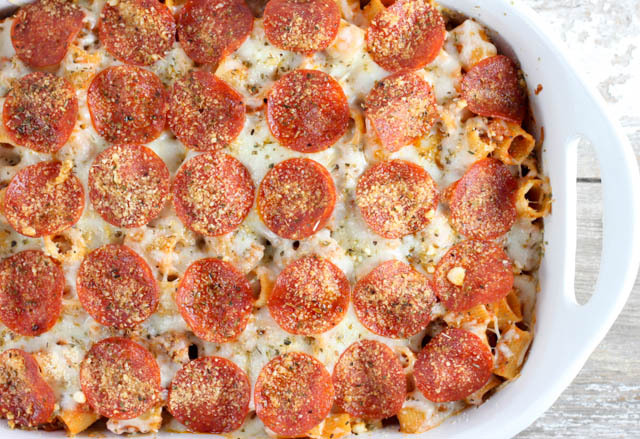 The best part about this casserole is that it can be customized based on everyone’s preferences. You can use whatever shaped pasta you like, I had rigatoni on hand. Sausage tastes great in this recipe but ground hamburger would work great too. We aren’t the biggest fans of mushrooms but I know people who love them and a can of sliced mushrooms could easily be added. 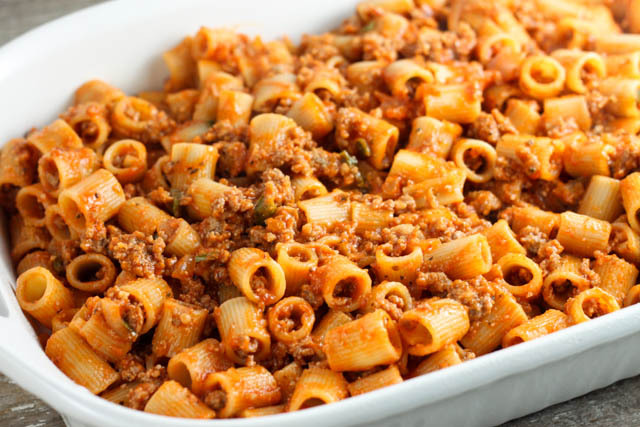 When you are baking pasta I always like to cook it al dente, a little firm to the bite because it will continue to cook while the casserole is baking. Brown the sausage, drain and then add the onion, green peppers and garlic; saute until the onions are translucent. In a large bowl combine the meat mixture, sauce, noodles and 1/4 cup Parmesan cheese; mix until combined. Grease a 9x13- inch dish with non-stick cooking spray. Top with shredded cheese and then pepperoni. Sprinkle with remaining Parmesan cheese and Oregano. Bake for 20 mins or until heated through and cheese is melted.